Happy Spring, y'all! Weather's warming up, some days anyway, and the bugs are waking up. 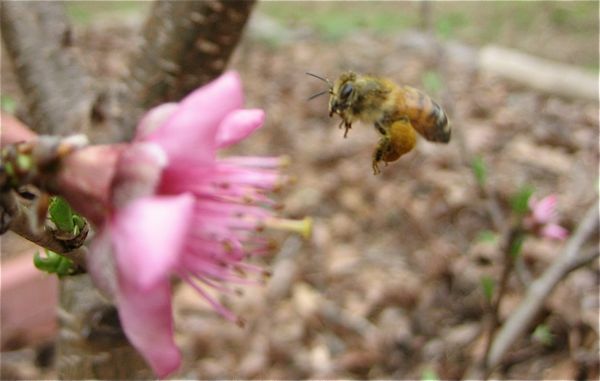 Exhibit A: honey bee on peach blossom. Notice her pollen baskets (golden bundles attached to her rear legs). Peachy, to us. What a bee sees is quite different. Pollen pantaloons: always in style. As explained here, bees have two rows of hairs on their rear legs that create a nifty spot for collecting pollen. 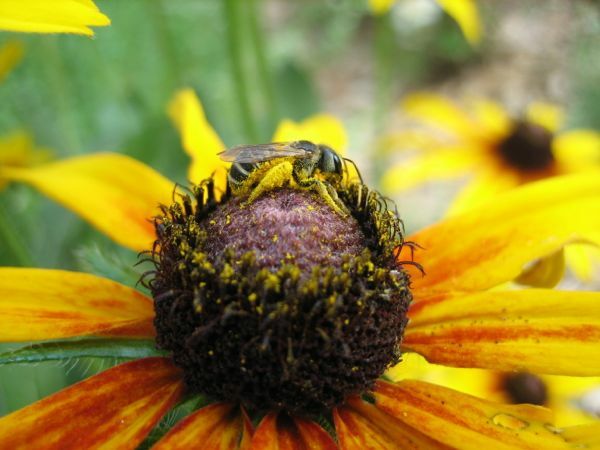 As bees visit flowers, they get covered in pollen (thanks to good old static cling). 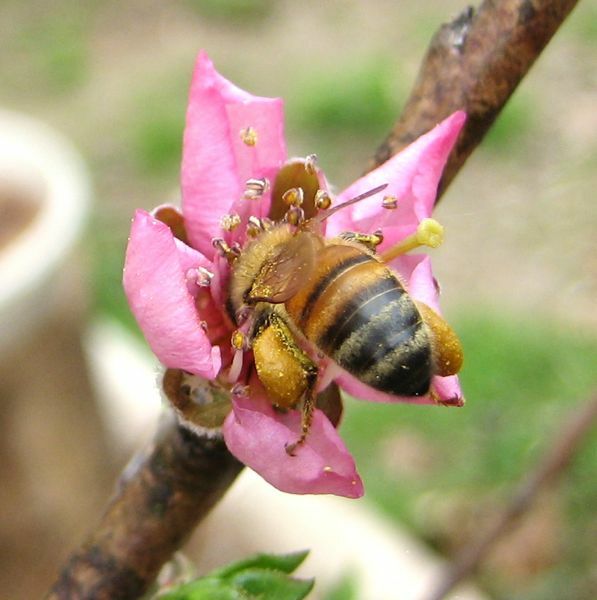 To collect that pollen, the bee grooms herself and moistens the pollen grains with honey or flower nectar, and into the pollen basket they go. When the bee returns to the hive, she will transfer the pollen bundle (now called bee pollen or bee bread) to a fellow worker bee, who is responsible for storing it. Bee pollen is an important food source for the hive, and a marketable product for bee pollen thieves (just kidding!). 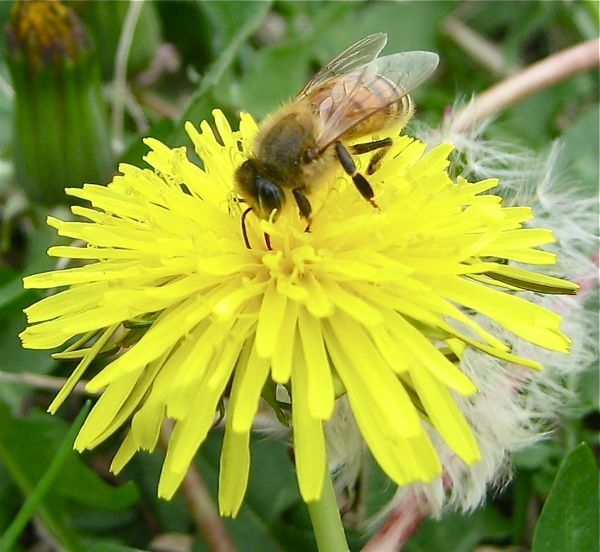 In contrast: a very clean bee, baskets empty, on a dandelion -- a source of nectar for bees when other sources a scarce. Great minds think alike -- people make wine out of dandelions when other sources are scarce. Support our Medlock pollinators, whether wild or domesticated. Here's a very comprehensive list of plants that add beauty and feed ze buzz-buzzs. Static harvest: the reason bees don't use dryer sheets. Black-eyed susans attract many beneficial insects and later in the season, goldfinches feed on their seeds. Click on this link for a "Yes" answer to "Is there anything goldfinches actually blend into?"